Following in the footsteps of former Texas A&M Football Coaches Gene Stallings and Jackie Sherrill, College Football Hall of Fame Coach R.C. Slocum headlined the Independent Cattlemen’s Association’s (ICA) 2013 Convention luncheon, June 28, 2013, at the Hyatt Regency Lost Pines Resort in Bastrop. Coach Slocum, the official spokesperson for The 50-Year Fence line of products, is also a central Texas landowner with interests closely connected to the cattle industry. The ICA has been representing cattlemen since 1974. As the premier representative for the cattle industry, ICA works hard to provide an effective legislative voice for farmers, ranchers, and cow/calf producers. Our objective is to promote change that supports efforts of cattlemen and their well-being, while combating policy that hinders the progress of the cattle industry. R.C. 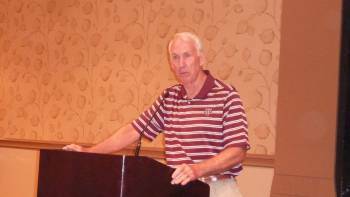 Slocum is the winningest football coach in Texas A&M University history and was recently inducted into the College Football Hall of Fame. Slocum will join The 50-Year Fence team at the 2013 TAM Beef Cattle Short Course, August 5-7, 2013, in College Station.